The world of Blue Moon is in chaos. Its god has abandoned it, and its people are in open war against each other, while the ruling power of three elemental dragons reigns above all! 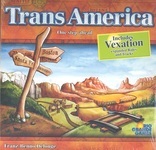 In this original 2-player game designed by Reiner Knizia, each player takes control over one of the Blue Moon peoples - the creative machinations of the Mimix, the fiery Vulca, and the clever Hoax - in their quest for dominance. The Blue Moon Legends basic set provides all the material needed to play, including details on the various peoples, a game board, full-color rules, and three plastic dragon figures. Expansion packs contain additional people cards. Mimix, Emissaries and Inquisitors: Allies, Emissaries and Inquisitors: Blessings, The Buka Invasion. Mimix:This expansion to Reiner Knizia's Blue Moon adds 30 new cards. The Mimix feature characters that can attack in pairs and powerful card texts that allow the player to retrieve cards from the draw and discard piles. Emissaries and Inquisitors: Allies / Blessings: These expansions to Blue Moon add 30 new cards each. Rather than being a stand alone deck, Emissaries and Inquisitors augments the other decks by adding cards to all the other available decks. Interference cards allow players to react out of turn to their opponent's plays. The powerful Hyla influence the game as a whole. The Tutu add strength, but at a price. The Emissaries can be added to other decks as-sold to include these new cards to the mix. Inquisitors change the deck building limitations for players interested in constructing decks. 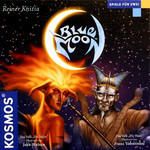 Blue Moon: Buka Invasion is a Peoples expansion for Reiner Knizia's Blue Moon. The deck includes 31 new cards and is playable right out of the box against any other Blue Moon deck. They can be combined with other decks or cards by using the advanced deck building rules. The devious pirates of the Buka invade the world of Blue Moon. Many cards can be loaded upon their ships to raid the opponent with unexpected force. And with the new "Bluff"-symbol a complete new concept enters the world of Blue Moon.